Emergency medicine is a specialty of medicine that focuses on the diagnosis and treatment of acute illnesses and injuries that require immediate medical attention. Accidents occur uninvited – that is why we call them accidents. Do you think you would thrive on the adrenaline and the fulfillment that comes from assisting injured people and people in any emergency life-threatening situations? An accident happens on the highway and an emergency trauma team kicks into action. A trauma doctor, a certified emergency nurse, an EMT and a paramedic rushes to the scene of the car crash with an ambulance as well as an ambulance helicopter. The emergency response professionals work as a team to evaluate the trauma patients. Neurological reflexes and pupil light reflexes are evaluated and a number of notes are made about the patient’s condition. (See the “How to Examine Patients” Course, PROJECT 25 & 27). The information is communicated via radio to the trauma unit where a dedicated trauma team of healthcare professionals prepare to receive and take over the treatment of the patients. The patients have been stabilized and arrive by helicopter at the hospital. The trauma surgeon and various specialists like neurosurgeons, orthopedic surgeons, radiologists and radiographers are ready to receive the injured patients. The radiographer takes a number of plain X-rays. The radiologist looks worried and arranges for CT-Scans. Does the patient have any bleeding on the brain? Looks like the neurosurgeon will have to evacuate (remove) a subdural hemorrhage. The Operating Theater is prepared and the anesthetist is ready to perform a general anesthetic. The general surgeon performs a laparoscopy (examines the abdomen with a camera) then the orthopedic surgeon reduces a fractured femur and now is the time for the neurosurgeon to evacuate the blood clot. Can you cope with seeing gross injuries, lots of blood and guts? Can you work and give your best under severe pressure? Do you thrive on adrenaline rushes? Are you decisive and can you make life-and-death decisions in a split second? Can you work long and stressful hours? Then you cut out to work as part of a trauma team. A first aid worker is a person who provides initial care for an illness or injury, usually for work-caused injuries. It is usually performed by a lay person to a sick or injured person in the time before medical staff arrive. A certified first responder is a person who provides pre-hospital care for medical emergencies. Certified first responders fill the gap between a basic first aid provider and an EMT. Emergency medical responders are people who are specially trained to provide out-of-hospital care in medical emergencies. There are many different types of emergency medical responders, each with different levels of training, ranging from first aid and basic life support to advanced life support. Terms may have different meanings with different training requirements in different countries. EMTs (Emergency Medical Technicians) are trained to assess a patient’s condition, and to perform emergency medical procedures needed to maintain a patent’s breathing and cardiovascular circulation until the patient can be transferred to an appropriate destination for advanced medical care. A paramedic is a medical professional, usually a member of the emergency medical service, who primarily provides pre-hospital advanced medical and trauma care. An emergency physician is a physician who works at the emergency department of a hospital to care for acutely ill patients. Training of an emergency physician entails a 4 year (premedical) B degree, then 4 years of medical school and then 3 years of internship and residency. Trauma surgeons are physicians who have completed residency training in general surgery and fellowship training in trauma or surgical critical care. Trauma surgeons must be familiar with a large variety of general surgical, thoracic, and vascular procedures and must be able to make complex decisions, often with little time and incomplete information. Proficiency in all aspects of intensive care medicine/critical care is required. Hours are irregular and there is a considerable amount of night, weekend, and holiday work. Salaries for trauma surgeons are comparable to those for general surgeons. Certified Emergency Nurse (CEN) is a licensed nurse who has demonstrated expertise in emergency nursing by passing an examination given by the Board of Certification for Emergency Nursing. 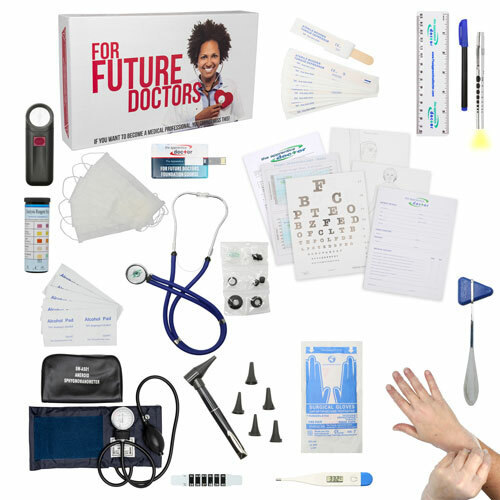 The Apprentice Doctor Foundation Course and Kit will teach you how to elicit a number of neurological reflexes, how to determine the heart rate, how to elicit and interpret a pupil light reflex as well as a number of emergency medicinal evaluation skills. 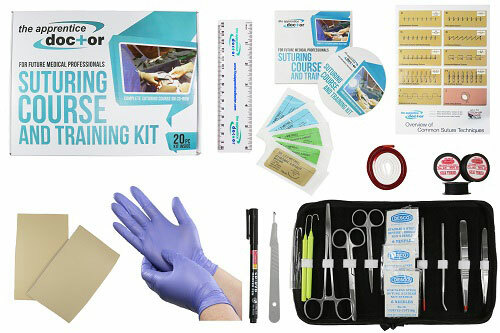 The Apprentice Doctor Suturing Course and Kitwill enable you to treat wounds and to stitch up wounds like a medical professional. YOU HAVE TO GET ME IN (Trauma surgeons). 4 years premed degree, 4 years med school and 3 or 4 years of emergency physician residency.